What should you do now that it is after Labor Day? a) Stop wearing white shoes and carrying a white purse. b) Finally plant those annual flowers that you purchased in May. c) Go to the big box store and discover that the garden center is now a gigantic Halloween store with Christmas decor on the shelves. d) Buy spring flowering bulbs. If you answered A, what are you doing here looking for fashion advice? If you answered B, the Society of Procrastinating Gardeners would like to invite you to join their club, just as soon as they get around to organizing themselves and sending out their next batch of invitations. If you answered C, you've just learned that big box stores don't really have garden centers. That's just an illusion of spring and early summer. They have "seasonal centers" and think that the gardening season is over now that it is past Labor Day. Get thee to a real garden center where real gardeners shop! If you answered D, you are correct! It is time to buy spring flowering bulbs, before the good ones are all sold out. I just placed my first order this past weekend for some "minor" bulbs, some species tulips, and a species iris. Shortly after I hit "send" on that order, I thought of more bulbs I want to get, so there will be a second order. 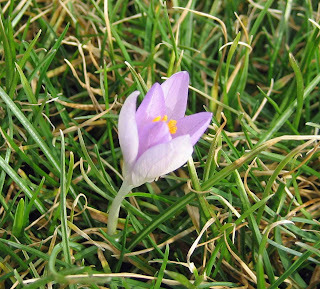 Before you buy your bulbs, check out my suggestions on Examiner.com for some different early spring flowering "minor" bulbs to buy, to get you out of your Crocus rut. Then you can sleep better, too, knowing you will get the spring flowering bulbs you want, not what is left over at the store after Halloween. This is not only a humorous post but very timely as well since I bought pink tulip bulbs today! Love it! I just bought some bulbs recently and still need to get more. Ooh, I am so tempted, I just put in a big batch of perennials and shrubs now that it is cooling off (finally!) but I have always been intimidated by planting bulbs since we have such long winters (I can't put tomatoes in until June!) and I never know how much leftover snow they will really tolerate. I can't buy my bulbs until next month, durn. If I wait and buy from our mg group I get the really cool heirlooms. Worth the wait. I ordered my bulbs recently too, but I got another catalog today & their running a 50% off so I will be ordering more. BULBS! BULBS! BULBS! One can NEVER have too many bulbs! Plant them and they will come and multiply! Anne in Reno, we don't put our tomatoes out until the first week of June, and we have plenty of bulbs. They can figure out for themselves when to emerge from the ground and can deal with any unseasonal snow. Couldn't find an email address for you, so hope you see this comment. It's that time...I was examining the Van Engelen catalog last night and had decided on squill and species tulips, both are new to me! Thanks kathy, I'll give 'em a shot then! I know I've seen tulips around here before! You mean that setting up the big inflatable pumpkin that I bought at the big box store isn't considered gardening? Huh, who knew? Thanks for your tips, Carol. I think I'll do bulbs this year, too. Maybe our climate will change and maybe I'll remember which ends goes in the ground facing down. Choice C sure seems to happen earlier and earlier each year. Halloween is up now but in a week or two they will start incorporating Christmas and turn it into a quasi Nightmare Before Christmas display. Too bad they can't wait a little longer. Still it's a good time to go there and get cheap plants at sales! Time to go pick out some bulbs! As president of the SPG, I'd like to thank you for mentioning our group. We're a "do as we say, not as we do bunch," and yes, I haven't ordered my bulbs yet. I missed ordering Autumn Crocuses & am still kicking myself. Maybe another kick will propel me off my procrastinating behind & get me ordering those spring blooming bulbs before the good ones are all gone. Spring bulbs??? I haven't even thought of them yet. Oh my. Let the procrastination begin. I'm holding off until after the hurricane passes by this weekend. I glanced at the bulbs at the big box store this weekend but wasn't tempted at all! The ones they carry don't work here and I've told them before that it is too late to be selling young tomato plants. Many times the best part of a post is the comments, and you all have certainly enhanced this post with your comments! Thanks for the humor, insights and helpful comments! Lancashire rose, please tell me you're joking about the tomatoes. I always feel guilty about buying plants at my local big box store, but even they aren't that clueless! Having previously been a founder member of the SPG - to the extent of having 500 bulbs completely devoured by mice before I got round to planting them last year - I have changed my ways this season. My office is carpeted with catalogues and orders and I am a smiling picture of efficiency have just ordered twelve thousand of the darned things. However, I predict that this slick organisation won't last and we will slip back into happy chaos very soon. Recently came upon fairly lily bulbs and had to have them. I'm in zone 5 (West Virginia). I am aware that I will put them in pots and bring them in the winter, but since I have the new bulbs NOW - how should I handle them over the winter? Put them in sand, vermiculate or moss or just leave them in the paper bag until spring?